RPS Ascension: Crossing the Diluphe (Winter, Year 2 and Spring, Year 3) | SPACE-BIFF! Raidon thinks little of Ichiro’s tactics for peace—snatching missives! Shaking like a child before the cyclops-god! Pandering to the whims of foreign pretenders! Raidon strains to remember that war was not prudent in the past, but a year of preparations has been unkind to Raidon’s spirits. He can hardly remember when he was Akenbei’s favorite, twelve months and a thousand years ago, when Raidon and his god had fought side-by-side to conquer the so-called “independent” tribes of Western Antopeos. Since returning to Roca to restore order (order which was not nearly so abandoned as Ichiro had made it to sound), Raidon’s eyes have turned increasingly to the Marverni fortress that sits visible on the horizon: a fort that stands high above the marsh it protects. As part of the agreement between the Yomikind and the Marverni, both the ramparts in Roca and the swamp fort at Diluphe have stood sentinel, always watchful of the mutually-distrustful neighbors. The ramparts of Roca and the swamp fort of Diluphe, both host to sizeable garrisons. Raidon would see that fort torn to the ground and its stones drowned to the bottom of the muck of Diluphe. They have waited so long in preparing for war that they seem weaker than ever. Akenbei sits in the great hall and drinks fermented rice. Raidon’s friend Rai slowly dies of rot in a distant land. Ichiro can hardly remember how to lead those few men who will follow his commands. Even if his peers—and his god—have forgotten it, Raidon knows that war is coming. And what better way to begin it than by tearing down that abominable ever-visible sentinel? Raidon patrols by day. He searches desperately for anything to fight—Marverni scouts, grumpy peasants, even a wild boar would do. But for weeks on end, there is nothing. Nothing but those damnable walls in the distance and the knowledge that a band of bare-chested Marverni warriors slog through the swamps, patrolling for any sight of the Yomi. Not that they could catch Raidon’s men even if a whole army of them were right there in the marsh. Raidon’s men are all handpicked: onetime bandits accustomed to hiding from the law and short bakemono able to disappear in clipped grass. So Raidon patrols by day, but by night he whispers into Akenbei’s slumbering ears. He whispers of conquest, of the fort in Diluphe. He whispers of cowardice, and that Akenbei must fight or he is a false god, and will be banished back to the fissures of Yomi for another hundred thousand years. Akenbei’s sleep is deep, and Raidon cannot be sure that his god hears. The message of Rai’s death is hard news for Raidon. He was killed, not by the Sauromatians that he spied upon, but by the Marverni warriors who invaded Sauromatian lands. It was a good death, the messengers report; but Raidon could hear the lie in their voices. The disease that had hollowed out Rai had left him too weak to fight, and in the end he hadn’t slain a single one of his attackers. Is this what passes for a noble death among the Yomi? Two messages arrive in the same day. Normally, Raidon could count on Ichiro hiding them beneath his skirts, afraid that Akenbei might actually declare war, but his recent scare has left him too fearful for even that. Wayland of Marverni announces that the Sauromatians have besieged Diluphe. This brings a thrill of panic to Raidon. To trade one oppressor for another! To have Diluphe garrisoned by yet another foe! This would not do. His first inclination is to honor the alliance with the Marverni by leading his army south to contend with Nirelye’s Sauromatians, but the second message is thankfully read out loud before he can storm out of the great hall. It appears that Nirelye is willing to ally with the Yomi against both Marverni and Oceania. Wayland believes he has the upper hand, and permits the Yomi to act as temporary peacekeepers. As the armies prepare to invade Marverni under the guise of being friendly liberators from Sauromatian oppression, Raidon receives bitter news. He will not accompany the main army to Diluphe, and it will be Hirohisa fighting by Akenbei’s side. Instead, Raidon will go west to the minor territory of Laria. His goal will be to sneak into the province and then reveal himself a month later, taking the defending militia by surprise at the same time that the main army batters down the gates of the swamp fort. In this way, the Marverni will lose two of their territories at the same time, but in the confusion might not be aware that their allies had turned on them. Raidon seethes at this news. It is a sound strategy, but he cannot stomach that he has been sent on a diversionary assault—or that he didn’t come up with the plan himself. 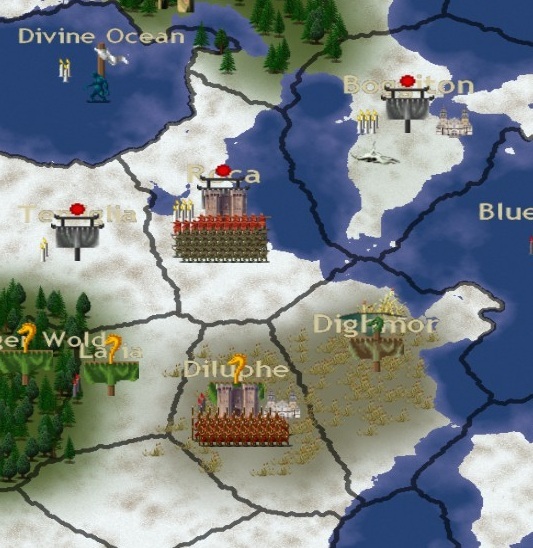 Crossing the Diluphe: Raidon sneaks west into Laria, while Akenbei, Hirohisa, Nanvather, and Ichiro march south. Within a day, the ramparts of Roca are emptied. Soon Akenbei’s army has besieged the swamp fort and Raidon’s men are well hidden in Laria. On the appointed day, Raidon reveals himself and attacks the local garrison. Raidon's army of bandits and bakemono versus the garrison of bare-chested warriors and slingers. The Yomi and Marverni are well-matched. The Marverni bare-chested warriors wear shields to protect them from bakemono arrows, but Raidon is a far superior commander to the nameless garrison leader of Laria. The Yomi quickly dispatch the defenders and begin patrolling the countryside to quell resistance while Raidon hikes to a small hill at the edge of the province. In the distance he can see the swamp fort of Diluphe, though it is impossible to make out the armies that fight there. He won’t find out specifics for another week, but when he returns to camp his men are relieved to find him calmer than expected. His raging is abated. While his forces execute a few households still loyal to the Marverni and then melt into the countryside in anticipation of a counterattack, Raidon is at peace, for he had seen enough of the swamp fort: smoke. A lot of smoke. The battle at Diluphe turns out to be a simple matter. 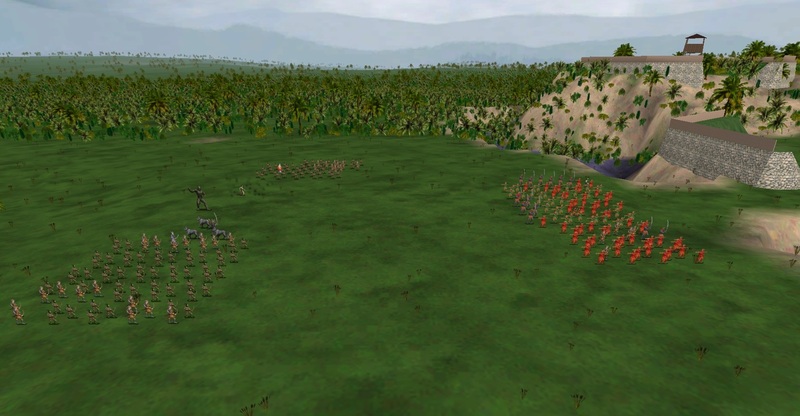 Most of the Marverni forces are out campaigning against the Sauromatians, who have been proving tricky foes as they invade province after province only to disappear as soon as Marverni braves respond in force. Thus, the swamp fort is woefully understaffed when Akenbei’s army of demons appears on its doorstep. Akenbei's army: the usual bakemono and bandits, and also assorted demons: chilly ao-oni (green), fiery aka-oni (red), and large kuro-oni (grey). Flames and arrows exterminate the garrison of Diluphe before they can exit the gate. The marshes of Diluphe have been crossed. 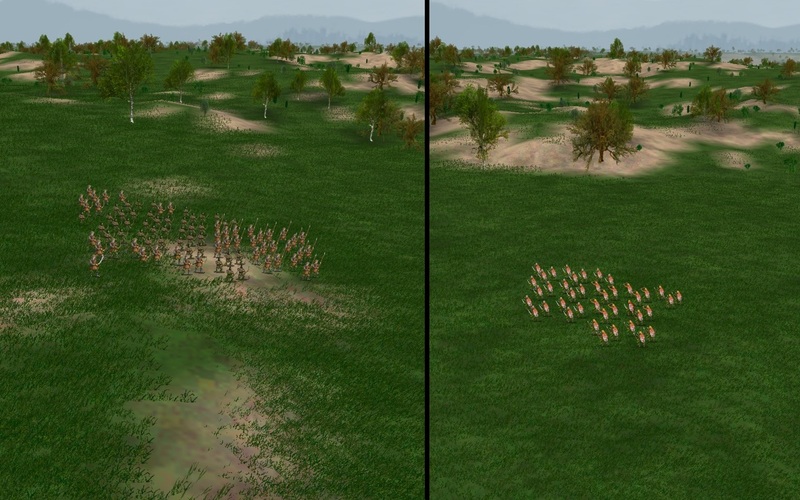 Akenbei’s army begins to strengthen at Diluphe while Raidon waits in Laria. All the while, the Sauromatians are rampaging back and forth. The Marverni army sits on the border, and by now Wayland must realize he has been betrayed. Ichiro thinks they are threatening counterattack, while Hirohisa believes that Wayland’s hands are too full to even consider an advance against the Yomi. Even hiding in fields and on hills, Raidon is happy. The Marverni threat has been put to rout, at least for the time being, and the Yomi are secure in a new alliance. The swamp fort is now in Yomi hands, and is churning out supplies and troops to fight its former masters. The war will be long, but at least now Raidon can be sure of who the enemy is. 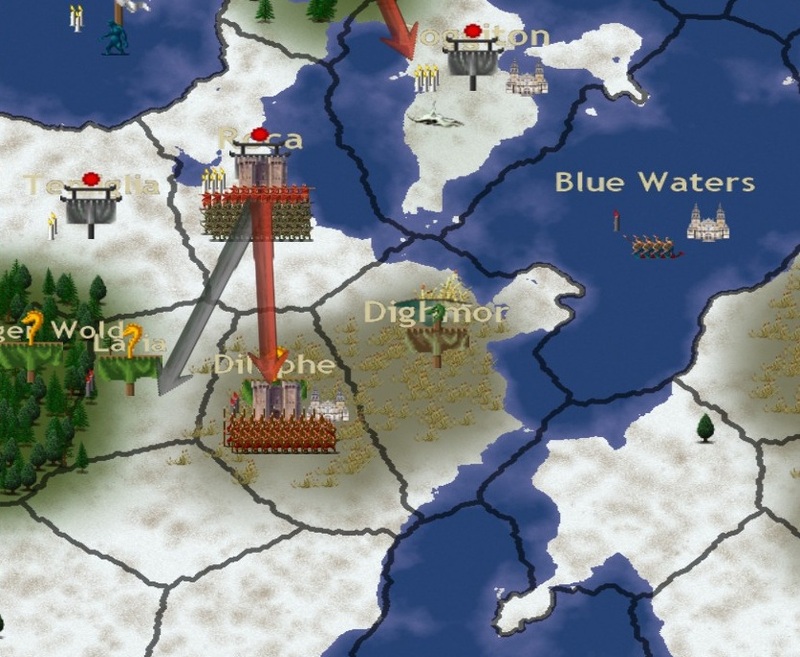 Posted on February 2, 2012, in Game Diary and tagged Dominions 3, RPS. Bookmark the permalink. 1 Comment.